ww2dbaseWillis Augustus Lee, Jr. was born in Natlee, Kentucky. 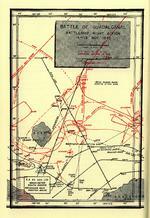 He graduated from the United States Naval Academy in 1908 and attended Naval War College in the late 1920s. Before the war, he held various posts on land and at sea, including time with the Asiatic Station, commanding several classes of surface ships (including the battleship Pennsylvania, BB-38), and later an officer of a Cruisers force. He was an excellent rifleman; he participated in various competitions and won several honors and awards throughout the younger portion of his career in the Navy. 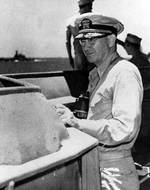 ww2dbaseAfter the Pearl Harbor attack that drew the US into war, Lee was promoted to the rank of rear admiral and became assistant chief of staff to the commander-in-chief of the US Fleet. In his next role as the commander of Battleship Division 6, flying his flag on the battleship Washington he led his battleships into a victory against Japanese surface units at the Naval Battle of Guadalcanal in Nov 1942. In this battle, Lee's task force sank the Japanese battleship Kirishima and prevented Japanese forces from recapturing strategic locations in the region. The victory was a feat that later earned him command of all American fast battleships in the Pacific while at the same time serving as the commander of Battleship Division 6 and Battleship Squadron 2. In Nov 1943, he commanded a task force that bombarded Nauru Island by aerial bombs and naval gunfire, then in Jan 1944 his fast battleships escorted carriers as their aircrafts attacked Japanese positions near Kavieng, New Ireland. 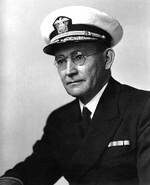 Developing fast battleships into effective carrier screening forces, he was responsible for setting the foundation for future American doctrine of battleship operations. His battleships escorted American carriers across central Pacific, hitting Truk, Tinian, and Saipan, then defended the American fleet against a Japanese air offensive at the Battle of the Philippine Sea. ww2dbaseIn May 1945, he left the Pacific theater for the Atlantic on a special mission to develop defenses against Japanese suicide attacks known as Kamikaze. In this role, he passed away from a heart attack in Aug 1945. His awards include the Navy Cross, the Legion of Merit, and the Distinguished Service Medal with gold star. He rests in peace at Arlington National Cemetery, Virginia, United States. ww2dbaseSource: Arlington National Cemetery, Naval Historical Center. 11 May 1888 Willis Lee was born. 25 Aug 1945 Willis Lee passed away.